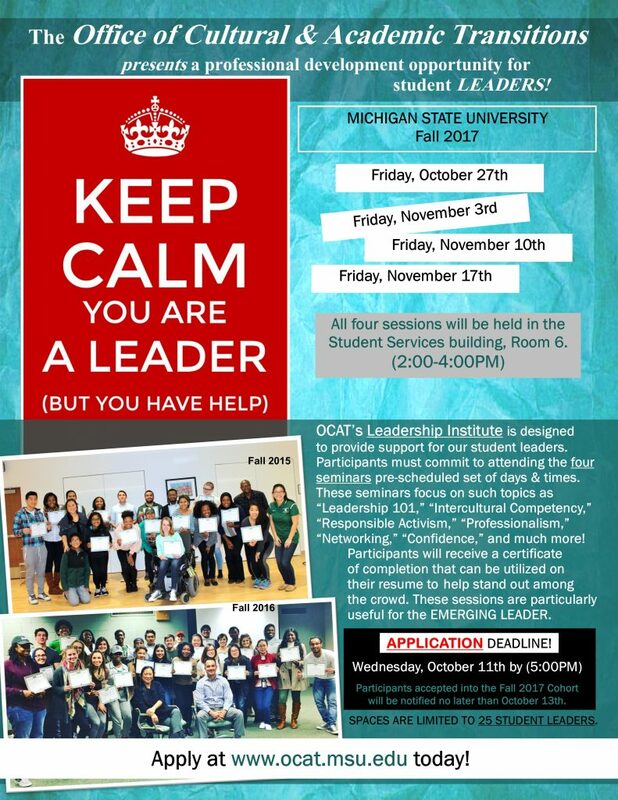 OCAT’s Leadership Institute is designed to provide support, knowledge, and tools for emerging student leaders. Participants must commit to attending all four seminars pre-scheduled set of days & times to receive a certificate of completion. These sessions focus on a variety of topics which are, but not limited to: interview and resume skills, group facilitation, utilizing resources and networking, and intercultural competency. The Leadership Institute is particularly useful for leaders that want want to develop their leadership skills and apply the tools given to them for their academic and paraprofessional career. If you have any questions, email ocat@msu.edu or call (517) 353-9140.